Microsoft Dynamics NAV ERP Software for Financial Management System provides robust and comprehensive solutions to your business, so that organizations can get smooth financial operations and activities. Navision India goal is to help every business achieve core financial management. MS Dynamics NAV financial management solution includes the basics of planning, book-keeping, budgeting and managing cash flow, etc. Apart from these, MS Dynamics NAV is fully integrates with Microsoft applications such as Outlook, Excel, Word, Dynamics CRM and SharePoint as well. 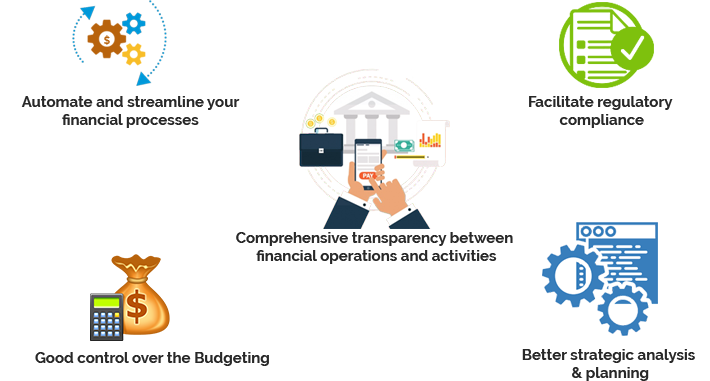 Whenever your organization needs ERP System for managing financial operations just go with Navision India and adopt Financial Management Software. If you have any queries regarding Financial Management Solutions contact to us at any time.